LOCATION: SE/4, SW/4, of NE/4 of Section 19, T7S-R8W on the south shore of Fort Bayou in the corporate limits of Ocean Springs. DIRECTIONS: From the intersection of Bienville Boulevard (US 90) and Washington Avenue at Ocean Springs, go north on Washington Avenue .09 miles, or about two blocks to Iberville Avenue. Turn right (east) at Iberville and go .25 miles to Sunset which is immediately left (north) inside of the sharp curve. On Sunset, proceed .15 miles northeast to the historic and scenic Evergreen Cemetery on Fort Bayou. HISTORY: The history of the Evergreen Cemetery in many ways reflects the religious and racial relations of the city of Ocean Springs. These relations have been characterized by tolerance, respect, and harmony through the decades. Protestant and Roman Catholic, Black and White have lived, worked, and died together in this small community. They are also buried together at Evergreen, a six-acre memorial park, featuring a tranquil, cedar and oak covered knoll, which is befitting the cliché "Resting in Peace". C. Ernest Schmidt (1904-1988) in Ocean Springs French Beachhead (1972) states, "the origin of Evergreen is not clear. County records show that it is part of land granted by patent to David Kerr and consigned to Philip P. Bowen on October 2, 1854." On October 19, 1900, Enoch N. Ramsay (1832-1916), County Surveyor, and George W. Davis (1842- 1914), Ocean Springs merchant and State Legislator, appeared before Justice of the Peace, Thomas W. Grayson (1825-1904), and swore under oath that the ground for the Evergreen Cemetery was given to the Town of Ocean Springs by P.P. Bowen circa 1860. Additionally, they said that the land had always been used as a cemetery and in undisputed possession of the town. When Philip P. Bowen (1799-1871) gave his land to establish the original public cemetery in the 1850s, Ocean Springs was a village centered about Jackson Avenue. These were the "Steamboat Days". At this time, it was common for people to bury their dead in family plots near their home. The Bellande (LaFontaine) Cemetery on Dewey Avenue developed in this manner. Evergreen is unique in that it was the first public cemetery dedicated as such. Bowen was a traveling minister who came to Mississippi via South Carolina. He was Elder of the Tidewater Baptist Church at Davis Bayou from 1847 to 1859. Pioneer, preacher Bowen discovered the mineral springs near the present Fort Bayou Bridge. He capitalized on the medicinal qualities of the water by building baths for both sexes at the site of the springs. Anecdotal history relates that a Sullivan was the first person to be buried in the new cemetery. The 1850 US Census for Jackson County has a New York born seaman named Daniel Sullivan (b. 1784) residing at Ocean Springs. The oldest surviving tombstone is that of I.D. Fuller, Jr. dated 1854. Some of the earlier families buried at Evergreen are Brad-ford, Davis, and Madsen. Although John Ames died relatively young, his family made an indelible mark on the history of Ocean Springs during the yellow fever epidemic of October 1878. When the dreaded "Yellow Jack" struck the Mississippi coast, initially at Ocean Springs, Miss Eliza Ames and her brothers led a small cadre of workers who nursed the sick and buried the dead. They worked day and night through the ordeal without remuneration or hope of reward. Miss Eliza Ames was known throughout her life for works of charity. The kind nature of this woman manifested itself in the pittance of money she asked when vending her land to the Catholic Church for only $25 in 1884. The Ocean Springs Cemetery Association was formed in September 1898. Mrs. H.S. Hyatt, was president and Mrs. J.J. Garrard (1839-1907), secretary. At this time, Lodge No. 23, The Knights of Honor, a black fraternal? Organization, also contributed to the improvement of the public cemetery The first Cemetery Board at Ocean Springs was formed during the administration of "The Yankee Mayor", F.M. Weed (1850-1926), between 1899-1910. The board consisted of: George W. Davis, Joseph Kotzum, and A. Switzer. Unfortunately, the Ocean Springs Cemetery Board was abolished in 1991. Today, there is a dire need for more citizen participation in the care and maintenance of our family and public cemeteries. Moran and Seymour, civil engineers of Biloxi, were hired in 1990?, to map the Evergreen Cemetery. A thought provoking and timely letter for each generation, titled, "Nevergreen Cemetery", by Anton P. Kotzum (1871-1916) was published in The Ocean Springs News of October 7, 1915. It reads as follows: The last resting place of the fathers and mothers of the citizens of Ocean Springs is in a deplorable condition. Weeds and thistles are rank and noxious vegetation has entirely overrun the place. What is needed is a caretaker; one could be had for $30.00 a month. Are there not thirty men in Ocean Springs who will obligate themselves to subscribe $1.00 each per month? To the end that the last earthly tenement of those whose labors and privations whose struggles with nature an adverse conditions have resulted in giving us their children the pleasantest, most beautiful location in which to spend our lives? The men and women lying in Evergreen cemetery are our own fathers and mothers, to them we owe our existence, to them we are indebted for our education, our rearing and to the fact that we are enjoying the sweetness of life. Many of them endured the rigors and hardships of war, the mothers endured their agonies and the fathers shouldered their cares and responsibilities, and they loved us, their children, more than life. Now that their labors are ended, cannot we display sufficient gratitude for all they have done to see that their last surroundings are at least kept clean and wholesome? Let us pause in our mad commercial career and reflect that one day, we too, shall be laid at rest in Evergreen, and it surely must be more consoling to think that we will be placed in a decently kept perhaps rose or flowered-bower, than the thought that some hardy pioneer will first have to clear a place for us in a veritable jungle. Let us arouse out of the careless lethargic custom of the village, and adopt methods more keeping with progressive America. Give it a trial for six months anyhow, and the prediction is made that after viewing the benefits that six months care will give, Evergreen cemetery will never again fall into such a condition as it is today. Who are the thirty men? The plea of Mr. Kotzum must have been effective, but by October 1921, the memory of his letter must have been a dim remembrance. At this time, The Jackson County Times, successor to The Ocean Springs News, placed an urgent notice to the members of the Cemetery Association to pay their dues. There was no money to pay the men who were working on the cemetery! By 1922, Miss Eliza Ames had passed on, and her nephew, Theodore Ames (1876-1927), controlled what remained of the Ames family lands in Section 19, T7S-R8W. In January of that year, Mr. Ames granted the St. Alphonsus Catholic Church a 30- foot wide strip of land running east from Cemetery Road through the northern portion of the Ames Tract to the Cemetery gate for the purpose of a road to enter the cemetery. Theodore Ames was a livery stable operator and Director of the Ocean Springs Brass Band in the early 1900s. His widow, Carrie Seymour (1899-1975), would live into modern times and be a true character of the City. She resided on Calhoun at "Carrie's Happy Hill", now the Queen Anne Cottage of Harriette Perry. Additional acreage was added to the Catholic Cemetery in May 1931, when the Catholic Diocese of Natchez purchased some land from Judge O.D. Davidson (1872-1938). This transaction is recorded in Jackson County Land Deed Book 101, p. 51 as follows: Commencing at the northeast corner of the Ames Tract where same intersects Cemetery Road and Evergreen Cemetery, running south on the west side of said road to the northeast corner of the W. Cooper property, thence northwest to the margin of the marsh, thence northward along said marsh to Evergreen Cemetery, thence eastward on the south side of Evergreen Cemetery to the point of beginning. In 1946, C.E. Schmidt (1904-1988) became the manager of the Catholic or St. Alphonsus Cemetery. A survey of the Catholic Cemetery was completed, and gravesites were sold to the general public regardless of creed for $5.00 per grave. In 1955, and 1957 vacant land to the east, south, and west were purchased and subsequently reclaimed to provide almost five hundred gravesites. These lands were provided to the Catholic Diocese of Natchez from Mrs. Carrie Johnson Garrard Everhart (1886-1968) and James F. Garrard (1906-1955+) in 1955, and Iola Y. Davidson (1883-1963) in 1957.
to form distinctive family burial plots. By 1974, one hundred twenty-eight gravesites had been sold which exhausted the supply of good land. The remaining gravesites were near the marsh or very low on the slope of the land. Fortunately for the City of Ocean Springs, the Catholic Church in Mississippi wanted to get out of the cemetery business. On December 12, 1974, the Catholic Diocese of Natchez-Jackson sold the following property to the City of Ocean Springs being located and situated in Section 19, Township 7 South, Range 8 West, in the City of Ocean Springs, Jackson County, Mississippi, and more particularly described as follows, to-wit: That certain cemetery or burial grounds described as: start at the southeast corner of the concrete coping around the Eley lot, which corner is on the South boundary of the City Cemetery, and then go West five feet to a point of beginning. Then South across a cemetery road and along the east side of grave lots owned by Mangin, Kittle, and Huber 96 feet to a corner; then west 20 feet to a corner; then south 38 feet to a corner; then West along the South side of grave lots owned by Roberts, Adams, Ramon, and Dart 62 feet to a corner; then South along East side of lots owned by Young and Hutchinson 44 feet to a corner; then West 20 feet to the Northeast corner of the Holloway lot; then 99 feet to the North side of the Ramsay grave lot; then east 22 feet to the Northeast corner of the Holt lot; then 27 feet along the East side of the Holt lot to a corner; then easterly along the North side of the wooded lot owned by the Davidson estate 232 feet to the edge of the marsh; then Northerly along the edge of the marsh 300 feet to the South boundary of the City Cemetery; then West along the South boundary of the City Cemetery 130 feet to the point of beginning. By 2005 all cemetery lots in the Evergreen Cemetery had been sold. 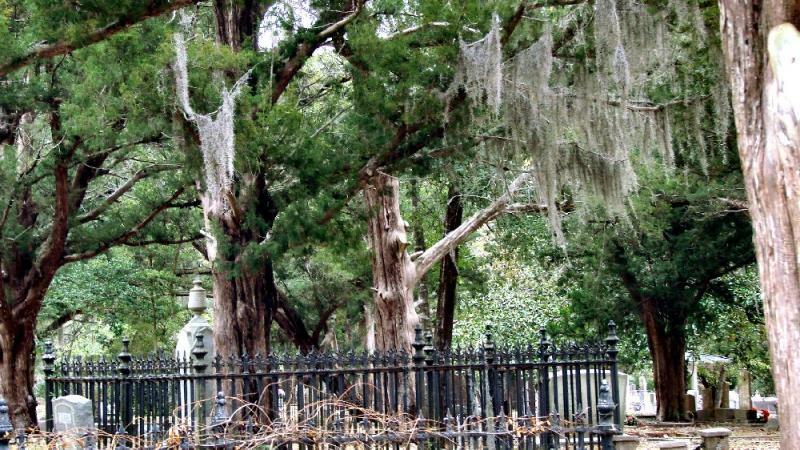 The City of Ocean Springs considered itself no longer in the cemetery business, and considered the lots private property to be maintained by the individual owners. With burial land at a premium, the City Coucil hired a ground radar survey company to perform a geophysical survey in the Evergreen Cemetery to locate 'barren' areas where potential grave sites might be created and sold. Also a low-lying area in the SE/C of the cemetery acquired from the Davidson family was being prepared for sale. In the spring of 2011, Merlin Allemand, city arborist, surveyed the cemetery grounds and determined that about 75 diseased trees should be removed. The cutting was done shortly thereafter. Regina Hines, Ocean Springs, 1892, (2nd Edition), (Lewis Printing Services: Pascagoula-1991), p. 30 and pp. 93-94. C.E. Schmidt, Ocean Springs French Beachhead, (Lewis Printing Services: Pascagoula-1972), p. 83. The History of Jackson County, Mississippi, "The Birth of a Church - 1832", (Jackson County Genealogical Society: Pascagoula-1989), p. 59. Requiem: Volume 3, "Evergreen Cemetery", (Jackson County Genealogical Society: Pascagoula-1972), pp. 1-31. Moran, Seymour & Associates, "Evergreen Cemetery", (City of Ocean Springs-Project No. 87-64), September 1988, pp. 1-35. C.E. Schmidt, "A Report to the Mayor and Board of Aldermen on the City Cemetery and Proposals for its Extension and Re-organization", (circa 1974), pp. 1-5. Jackson County Chancery Clerk's Office, Plat Book 1, "Evergreen Cemetery" (October 19, 1900), p. 9. The Daily Herald, “Ocean Springs News Paragraphs”, June 26, 1928. The Jackson County Times, "Local News", October 8, 1921. The Ocean Springs Record, "Holder of certain cemetery lot receipts have 30 days", November 18, 1971, p. 3. The Ocean Springs Record, "Evergreen Cemetery's Future Poses Problem", October 23, 1975, p. 1. The Ocean Springs Record, “Little burial space left”, June 6, 1983, p. 1. The Pascagoula Democrat-Star, "Ocean Springs Locals", September 23, 1898. The Pascagoula Democrat-Star, "Ocean Springs Locals", November 4, 1898. The Pascagoula Democrat-Star, "Ocean Springs Locals", August 4, 1899. US Census - Jackson County, Mississippi (1850). Buford child, two year old son of Dr. Buford to 18?? Sarah Ann Sheppard Cox 1820 to ? Benjamin Sorsby Davis, MD 1831 to 8-24-1870. John Gary 1863 to 6-3-1914 or 6-26-1914? Logan (infant baby girl) 4-? to 4-? John S. McClure 1827 to ? Doris Money age 52, 5 mo., 18 da. Kate Johnson Ramsey 1929 to 12-1957. Dunklin Felix Reid 5-1872 to ? Marie Antoinette Smith to 12-17-196? Nancy Smith 12-1869 to 1964? ?????? Wormly 92 yrs 2 mo. The Daily Herald, "Dies [Addie Bee Harvel] in Ocean Springs", March 31, 1928, p. 2. The Daily Herald, "Frank Condon dies", May 4, 1940, p. 3. The Daily Herald, "Injuries fatal to F.M. [Frank Marion] Mitchell", February 6, 1941, p. 1. The Daily Herald, "Mrs. [Wileminia Booker] Beaugez hurt in auto wreck died", February 13, 1941, p. 1. The Daily Herald, "Mrs. Maura buried", October 7, 1946, p. 6. The Daily Picayune, "Mrs. Robert B. Jones [nee Lucy Bartlett]", January 18, 1904, p. 9. The Sun Herald, "Sandra Kay Miller Hebert", August 2, 2011, p. A4. The Sun Herald, "Mrs. Eleanor Hamel Young", August 7, 2011, p. A13. The Sun Herald, "Fran Reneau", May 31, 2012, p. A4. The Sun Herald, "Ocean Springs OKs cemetery survey to carve out new plots", July 4, p. A6. The Sun Herald, "Pearl Miller", July 6, 2012, p. A4. * Inferred burial. No proven record.